2012 - Season 10 Wrap Up. 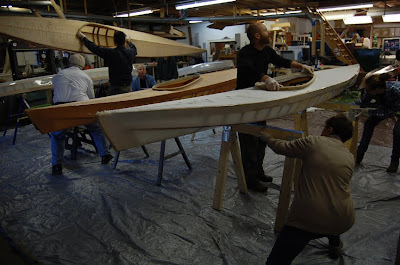 Sunday Dec 30th - Our last scheduled trip was off the water by 1pm, the shop floor is swept, and the counter cleared as we conclude our 9th year. We've had a great year and would like to thank you all for being a part of it. 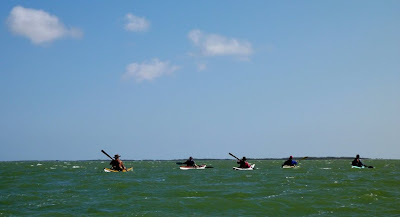 We were pleased to introduce many newcomers to the fantastic world of paddlesports, as we took over one thousand people kayaking on the Georgia coast. 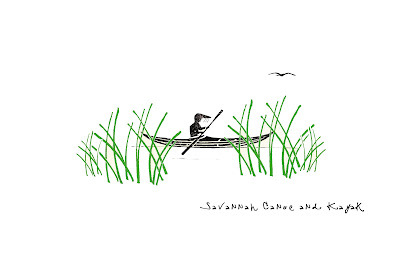 Next year will be our tenth year in business as Savannah Canoe and Kayak. And to quote somebody around here...."If I'd known I was going to own a paddlesports business, I would of married a doctor ". But it's too late for that now, and there is no going back. So, 'what's new in 013 ? ', you ask. Well, actually nothing. We will continue to run high quality, low volume trips and classes. The shop will again be stocked with the finest selection of paddle craft and accessories from around the world. The service will be attentive and jovial, and our monthly thursday evening meet ups will continue as scheduled. We look forward to seeing more of our new customers in 2013, as well as all you 'old dogs' who give us such a good laugh. And if you did not enjoy your expereince with us this year, we are sorry..we did the best we could. Happy New Year...the year of the snake... may we spread joy, consume less and pick up garbage. Here are a few slides from 2012. "I wanted to say thanks again for the use of the P&H Scorpio and all of the great advise and wise council for our Georgia Coast Adventure. 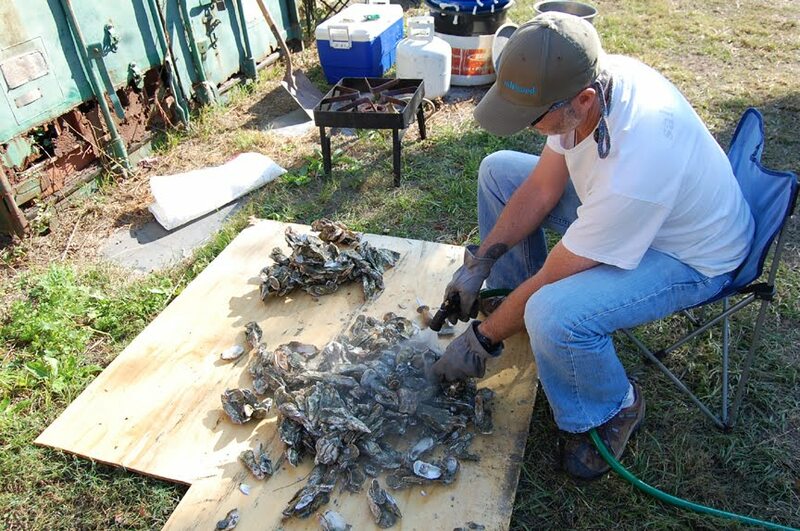 The trip was a great success and we have raised close to $10,000.00 for Georgia coastal environmental non-profits." "The Scorpio was a fantastic boat for the trip, which was close to 150 miles with strong winds, heavy spring tides and small craft advisories that were very challenging. The crossing of the sound between St Simons and Jekyll were at the limit of my strength and skill. Nigel had said that this was an expedition and he was right. He also said that a lot of people talk about kayaking the Georgia Coast and not may people actually do it. His experience and suggestions for the trip were invaluable as was the day of training and self rescue off of Little Tybee Island. We often quoted Nigel throughout the 8 day trip. 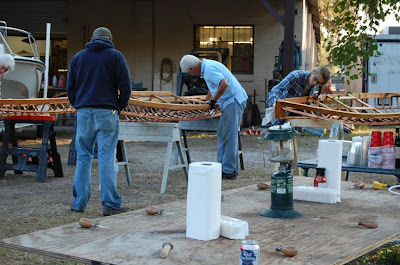 Savannah Canoe and Kayak is a wonderful resource for coastal watersports, equipment, instruction and friendship. 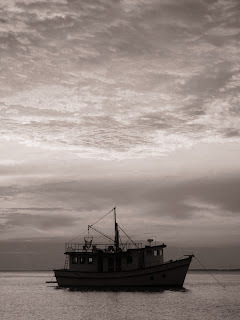 The Scorpio was very comfortable and it excelled in surf and waves. The day hatches worked well and are a great feature of the Scorpio. It was an excellent choice for this adventure. Some of the highlights were the raw beauty of this special part of the world, over 100 dolphins - two of which gently touched the Scorpio. I saw a mature dolphin with a young dolphin by it's side, great birding, seeing the wild horses and the uniqueness of Cumberland Island. Big paddles across the sounds with 3 foot waves and 61 degree water temperatures. 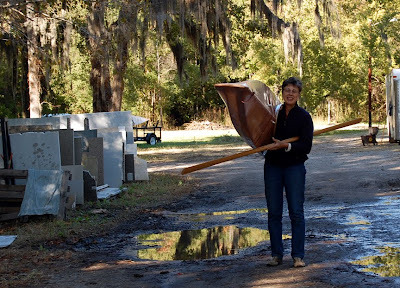 I thought that we would paddle hard in the morning, eat lunch, take a nap and read a bit but the 8 day schedule to go from Hilton Head to Florida required hard paddling almost all day everyday, with many times setting up camp in the dark. The first night the low as 37 degrees on a sandspur covered campsite on Little Tybee. I sincerely appreciate the support from P&H and SC&K for the assistance with this trip." James was part of a 4 man team on this trip. Philip Hodges, Allen Bradley, Doug Pettersen and James Marlow. The Georgia Coast, only 100 miles long and a mere fathom deep in many places, offers some of the last natural coastline on the Eastern Seaboard. the shallowness and the estuaries, combined with our large tidal fluctuations, that provide the DNA for the make-up of the Georgia Coast. This is a coast of fluctuations. Fringing the ocean like precious beads are the barrier islands that protect our salt marsh. 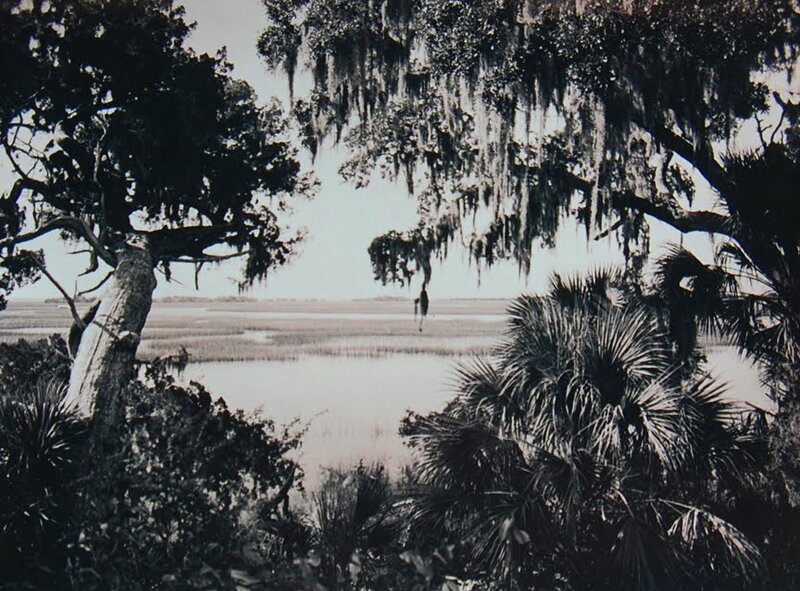 Under the lush canopies of Ossabaw, St Catherine's and Blackbeard Islands, man has hunted, fished and sustained social communes here for 5000 years... from the richest of the rich to the poorest of the poor, and everyone in between. We'll get a peek at some of this habitation, both past and present. 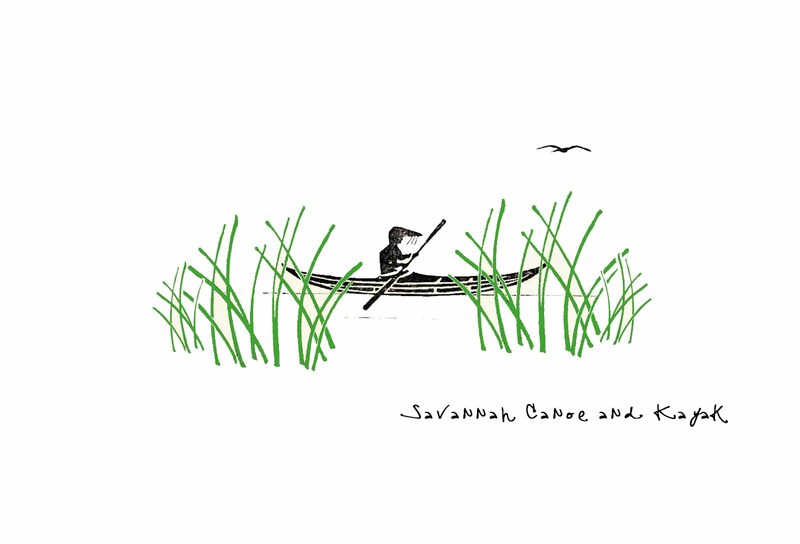 To kayak, camp, and explore down the Georgia Coast is an adventure experienced by few. Our actual course down the coast will take in much of the frontside of the first 50 miles, but back rivers and alternate routes will be utilized as needed. 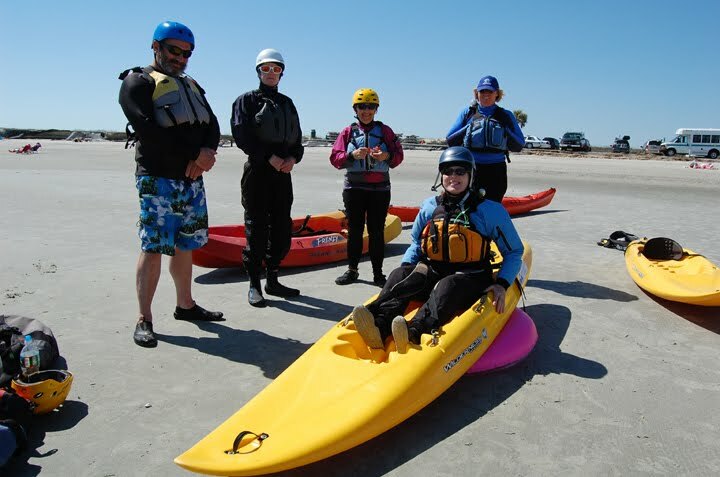 Interested paddlers should be intermediate in skill level, in good physical health, with experience in coastal waters, and need to have appropriate kayaks and gear for the expedition. The cost includes guiding and camping fees, all breakfasts and dinners, one night's accommodation aboard the shrimp boat, and a shuttle back to the launch site. All participants will provide their own kayaking equipment, camping equipment, and daily lunches. Equipment can be rented for an extra fee. Please give us a call to learn more about this exciting opportunity and to register. We are kicking off our 10th year and 11th season in business with this fun weekend program! February 8, 9 + 10, 2013. 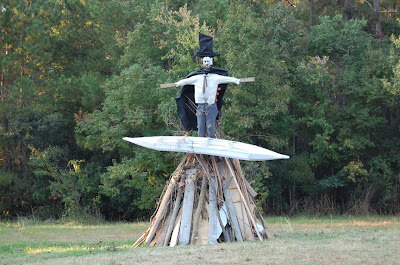 While camped beneath the oaks of Little Talbot State Park, this workshop will cover everything the aspiring surf instructor needs to conduct a safe and fun class in the zone. This is a 'short boat' surf class and not for sea kayaks or other large unweildy kayaks unsuitable for beach breaks and crowded surf zones. The Instructor Certification Workshop is designed for current ACA instructors, but the course will also be run as a Instructor Development Workshop for future aspirant coaches. 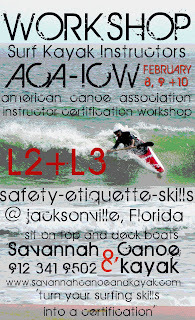 All participants must be ACA members and Red Cross/CPR certified. Day One : Covers a 'teaching and learning styles' refresher for the progressive teacher, as well as a flatwater strokes primer. 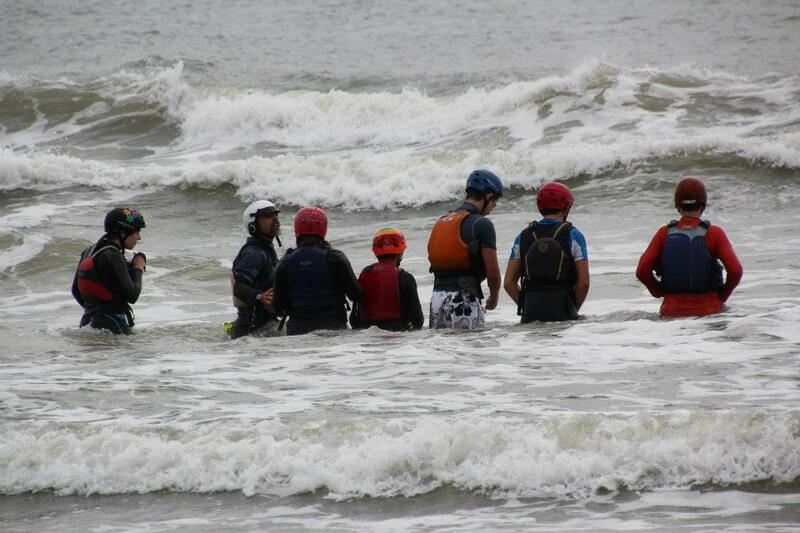 Day Three : L3 Intro to Surf - Nuts and Bolts moves and personal skills evaluation. Yes, there will be some surfing. - Personal and group safety. - The ability to relay information in a concise and interesting manner. - Knowledge of the sport. - Knowledge of the ACA. - Personal skills and personel skills. 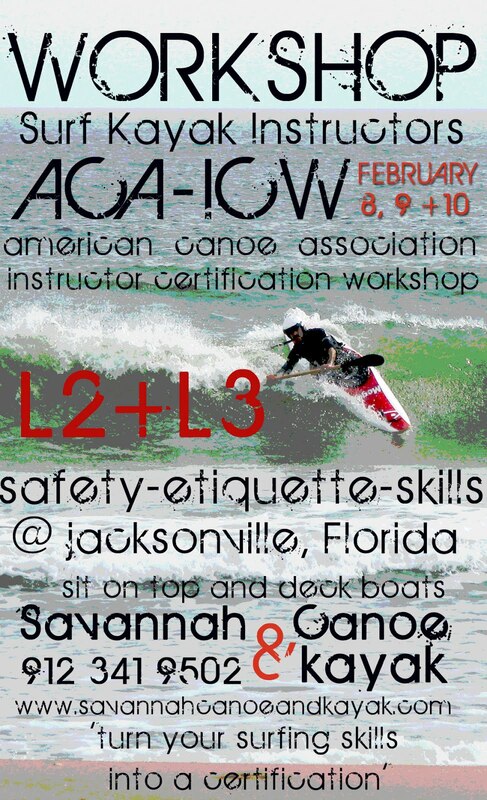 - Operating an ACA surf kayak class within the designated remit. "From start to finish the build took us just under a week’s time. As well as acquiring a new knowledge of woodworking and sewing skills during the class, I also gained a much greater respect for Brian’s expertise and attention to detail as an instructor, paddler, and craftsman. The West Greenland boat I built is an amazingly elegant and beautiful boat. Weighing a mere 25lbs., it is super fast on the water, and it sits just above the water-line, so it is virtually unaffected by wind. 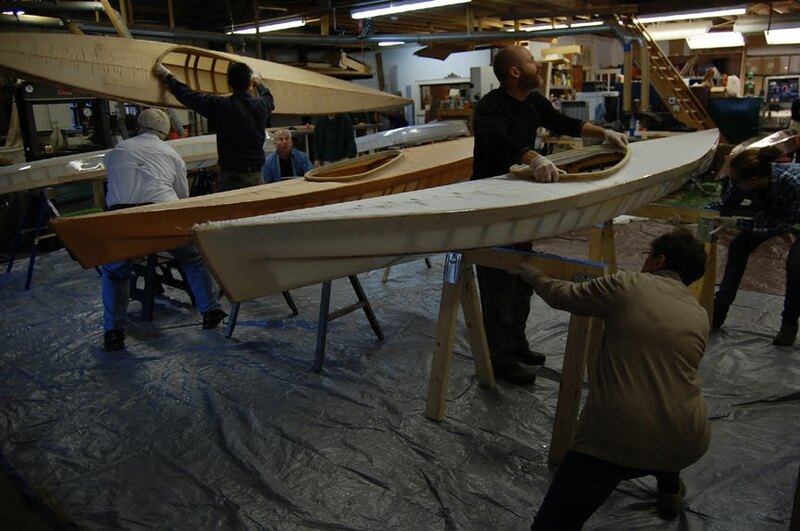 It is a great option for someone wanting to practice rolling and even more of the traditional Greenland-style paddling techniques.."
To avoid the unpleasantness of Mercury in retrograde, we have brought our 2013 Skin On Frame Workshop forward into October. 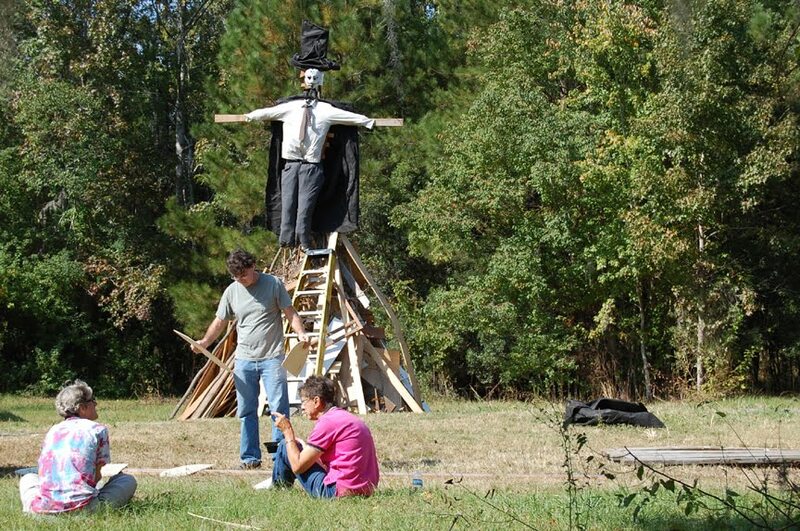 The class will run 6 1/2 days from Saturday, Oct. 19th to Friday, Oct. 25th, from 8:30am-5:00pm daily. 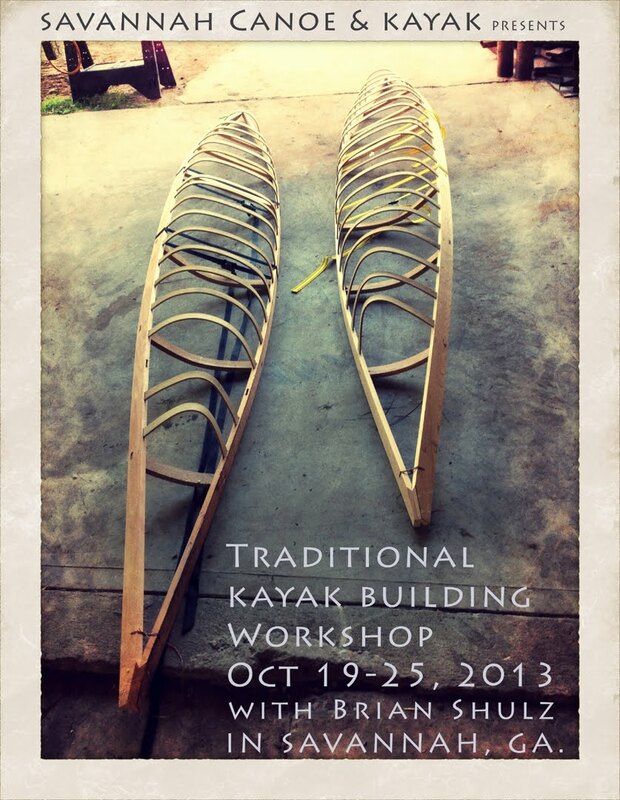 It will be held in the workshop behind the Savannah Canoe and Kayak storefront. We have 6 places open for this unique program. 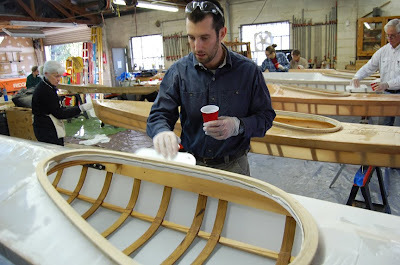 The total cost is $1850.00, which includes all materials needed to build your own boat and Greenland-style paddle. Please call with any questions you may have or to reserve your place today! Texas gal, Gail, spent three weeks here in Savannah this last November. She came for our boat building class, but also filled her time with kayak instruction and trips with ourselves, as well as Cheri and Turner the Green Team, who were also in the neighbourhood. Apart from leaving town with a new SOF kayak, Gail also picked up a new Tiderace Xcite S. Gail's initial concerns with the Xcite were that it would be slow, as it scores very low for 'speed' on the Tiderace website. "Some kind of weird typo error" we said, as we know the Xcite S to be very responsive, agile and quite nimble. Anyway, Gail sent us this great update from the third coast. Did my first kayak camping trip this weekend and it was wonderful. Six of us paddled 9 miles out to the barrier islands and camped near the dunes. Going out we had 15-20 knot winds and coming back less wind, but a real choppy following sea. It was a group of 4 very experienced paddlers, one other novice and me. I wasn't trying to paddle fast but ended up way out front. The Tiderace website is way off on the Xcite speed rating. It was fully loaded and more sluggish than I'm used to, but am delighted by how well it handled. The trip leader was John Whorff, an avid Texas coastal paddler who has written a wonderful book called "Kayaking the Texas Coast". He is also a zoologist, so visiting the barrier islands with him was a special treat because he is so knowledgeable about everything we saw. 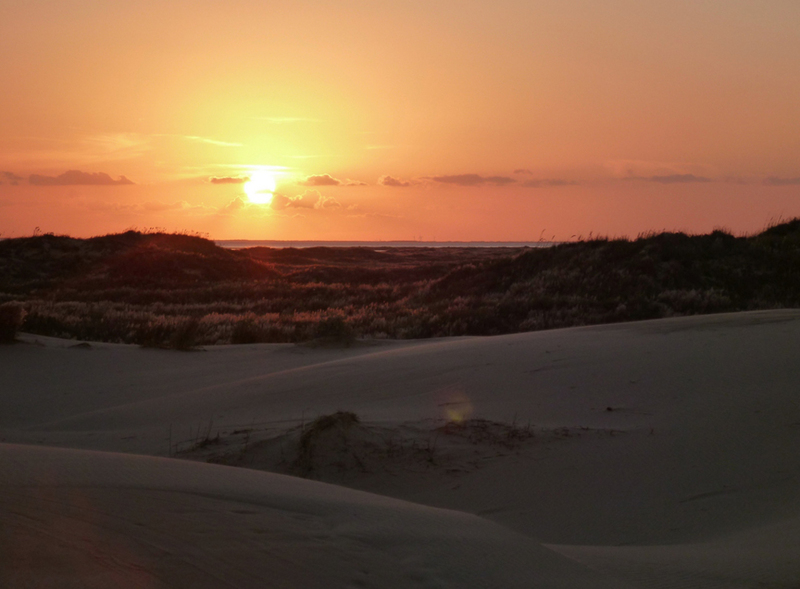 The dunes we camped on are amazing, stretching for miles, lots of wildlife, no people. I'm sending you a copy of his book, as a thank you for getting me into the Tiderace and letting me take the workshop, and as an inducement for you to consider coming down here for some paddling. We had 80 degree weather and 80 degree water, no dry tops required. You'd be welcome to stay at my house and there are lots of beautiful places to paddle, rivers, bays, challenging surf. So if winter gets you down, consider a trip to Texas. 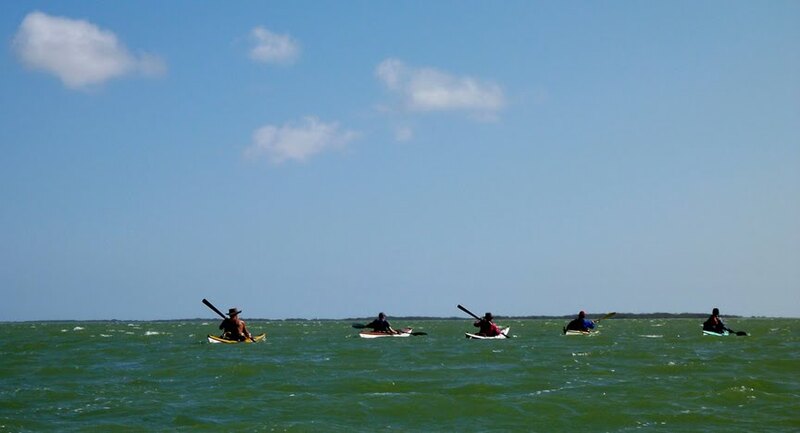 Don't think many people know what great paddling there is on the Texas coast, especially when it is so cold up north. John Whorff's book is full of trip maps, writeups and photos so think you will enjoy reviewing. Here's the Amazon link and a description. I found a beach not to far from my house where I can park and walk about 50 feet to the water with the F1 on my shoulder. I keep the Tiderace in a cradle at the harbor but have found a way of carrying it on my shoulder to get it on and off the car. Am so happy with my two beautiful kayaks. Many, many thanks to you both, and to Zak as well." And thanks very much for John's book...it looks very good. 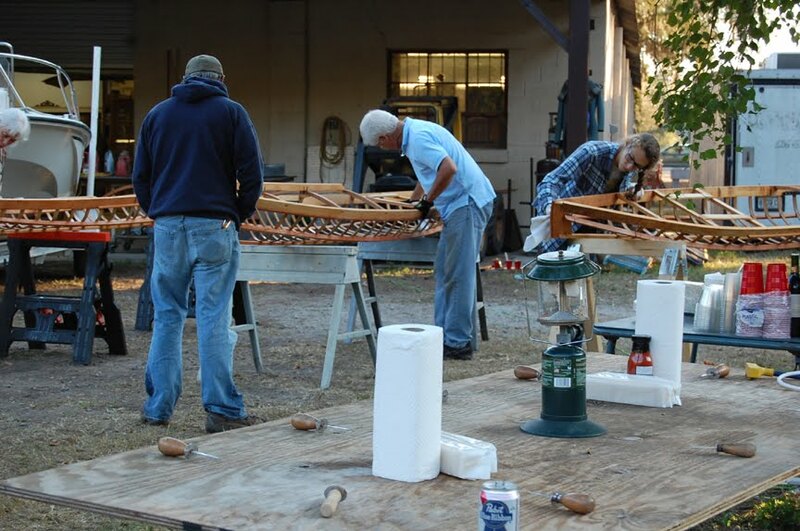 We sure hope that by the time we are seventy years of age we too are taking up new, adventurous hobbies and doing crazy boat building courses. You are rocking it, girl. 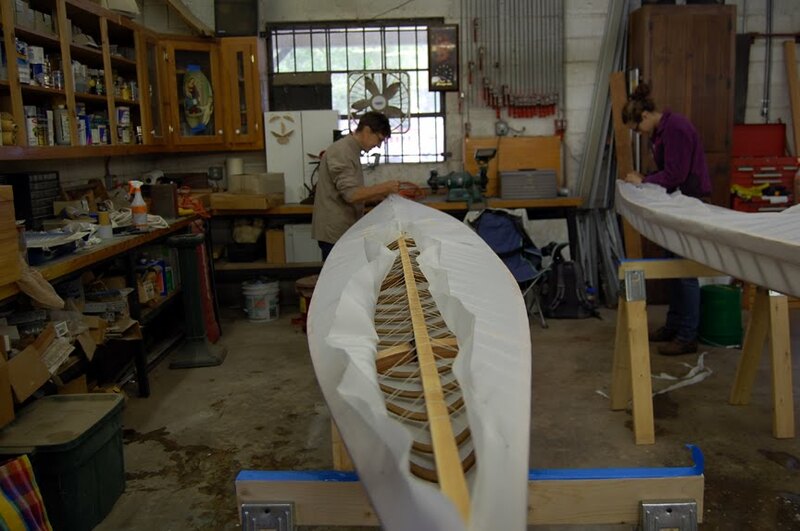 Last month, Kathryn took part in our Traditional SOF kayak building workshop. 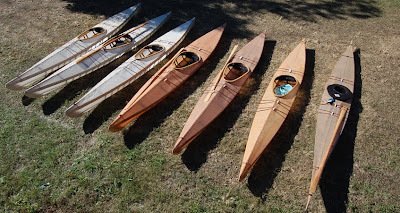 She built the traditional west Greenland design kayak, on the far right. The Greenland float bags arrived yesterday along with gorgeous sunny weather, so today I went with a couple of friends for my SOF's first official "journey". My primary and preferred means of kayak transport here is a bike and trailer. Our driveway is slightly elevated at the street and with my fiberglass boat, I have to walk the bike up the incline. Not today!! I made it to the launch in record time, too, without having that extra 25 or 30 lbs. We left from the Back River and followed the course of the Little Tybee Challenge (an annual kayak race for the local marine science center); it's about a 7.5 mile course that, as described in the race literature, passes "through narrow tidal creeks, broad tidal rivers, open coastal areas, and two surf zones". The kayak handled remarkably well in all areas. I stayed warm, comfortable, and dry the whole time. As we entered the first surf zone, I took a couple of big waves; I'm not used to seeing the deck so easily washed over. Once, I was picked up and unexpectedly capsized by a large wave (large by Tybee standards...). 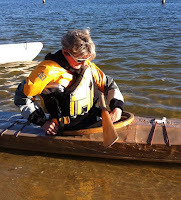 Rolling was a breeze and felt completely natural and much to my relief, my spare paddle stayed secure in the deck lines. The spray skirt stayed tight and there was no water in the boat when we arrived back at the launch. We didn't have to fight a lot of current or wind on this trip, but I felt that the boat handled very well and was responsive to correction. I was able to keep pace with my companions (in a Valley Nordkapp LV and NDK Explorer) who assured me they were paddling at their normal speed (though not their race speed). 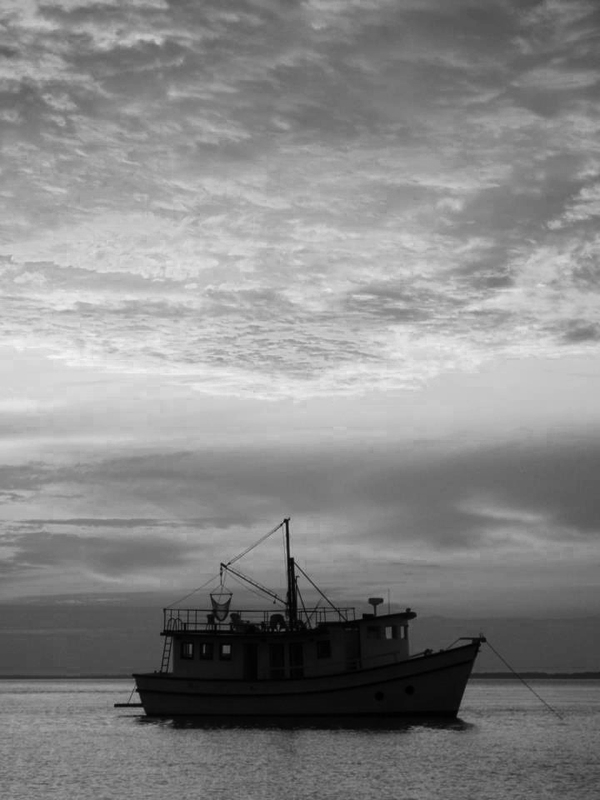 It was just a beautiful morning and I couldn't be happier with the boat. I hope you all are having a good holiday season and that you're getting out to paddle some yourselves!